You Miss Bread and Cookies? There are many reasons to embark on a ketogenic diet. The Ketogenic diet is a low carb diet with added fat. I've been on a low carb diet for over 20 years, which I started following because of wanting to reclaim my health after living with type 1 diabetes for many years. About 40 years ago I decided I would search for the best healing diet and protocol to heal the type 1. So I began an intense self study of nutrition, which about 8 years ago led me to whole heartedly embrace the what I now call the Locavore/Ketogenic Lifestyle. So I eat mostly locally grown food, low carb and healthy fat. The ketogenic diet was first used in the 1920's for epileptic kids to quell their seizures and would have probably been useful for diabetic children (back then there wasn't kinds of duabetes known besides obese adults and young children diabetics) but the discovery of insulin and its manufacture virtually stopped any further nutritional exploration for the condition. In my healthy fat section of my ketogenic diet, I like to use local fats mostly, non-factory made fats like locally produced lard, made from Pork fat and butter, made from cream of local grassfed cows, fats that I actually make in my own kitchen. I would try to include in this list duck fat and tallow, but they are not easily procured for me. I also used coconut oil in my diet if desired, but of course it is never local as I live in Maine. I bend my rules when I feel like it. To the recipes! Every once in a while, not very often, I want some bread or cookies, I don't often miss desserts because I find what I eat so satisfying! But, I get it, first of all it's bread, what about bread? Line a leaf pan with parchment paper. Pour batter into lined pan. Place in oven for 50 minutes, that's how long mine took. You know your oven so check periodically to see how yours is doing. I took mine out and let it cool on the counter then lifted it out to slice. It's pretty soft but tasty and delicious with fresh butter. 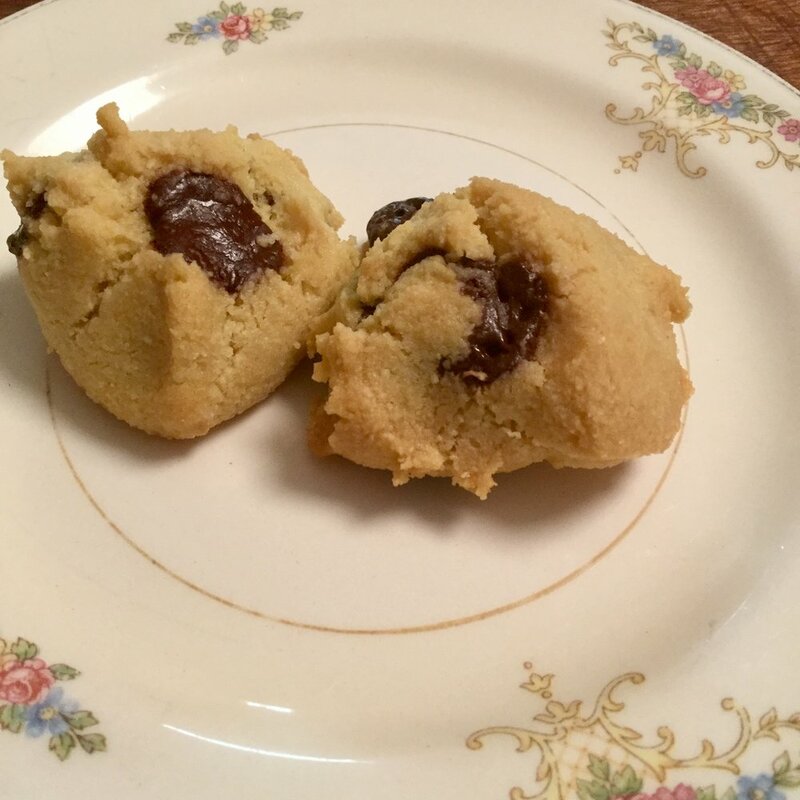 1/3 cup Pascha Chocolate Chips, I love these. Pascha are totally unsweetened and organic . They take getting used to, but I love them and I do much better with them. Mix butter, egg, coconut butter , vanilla in medium bowl. Stir together dry ingredients, flour, soda, powder, salt, stevia. Add dry ingredients into mixture, then stir in chocolate chips. Place parchment paper on cookie sheet. Drop cookie dough bu Tablespoons onto cookie sheet. Bake cookies at 350 F for 10-12 minutes. Whatever your reason for eating low carb or Ketogenic, whether it's type 1 diabetes, or type 2, or candida in your system, or manafesting weight loss, or becoming a fat burner, or simply plannng for longevity, I'm hopeful these simple recipes will bring you JOY!